Our Smiley Face Sampler makes a great gift for anyone in need of a little happy. 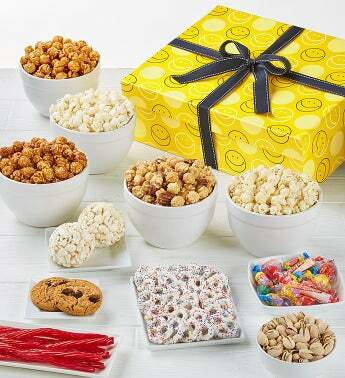 The cheery gift box comes filled with Dry-roasted Peanuts, Chocolate Chip Cookies, a Smiley Face Sugar Cookie, Gummy Bears, Smarties and 3 flavors of gourmet popcorn: Cheese, Caramel and Chocolate. 1.6 oz. Cracked Pepper & Sea Salt – Boldly seasoned with cracked pepper and gourmet sea salt, simple and delicious! 7 oz. Toffee Caramel Sea Salt Popcorn – Our gourmet popcorn smothered in caramelized toffee with a touch of sea salt, a super-rich snacking event. 6 oz. Almond Pecan Popcorn – Almonds, crunchy pecans and premium popcorn tossed together with a rich, buttery, secret-recipe glaze, a snackalicious treat! 5 oz. Natural Pistachios – a salted, premium nut delicacy! 6 oz. Rainbow Mini Pretzels – Mini pretzels covered in a sweet confectioners’ coating sprinkled with rainbow candy bits. 2 Popcorn Balls, 2.2 oz. – Our original recipe Popcorn Balls, the perfect fun and delicious treat! 2 Chocolate Chunk Cookies, 2.15 oz. – Soft baked, chewy and delicious cookie loaded with chunks of milk chocolate. 3.5 oz. Red Licorice Twists – The classic, sweet and chewy candy favorite! 2 oz. Smarties – The original candy roll in assorted fruit flavors!